Gloves – The out­er crust on cot­ton­wood bark can be very hard and abra­sive and good gloves are impor­tant to avoid dam­age to your hands. What­ev­er gloves you use, they are like­ly to wear out quick­ly if you han­dle a lot of bark. 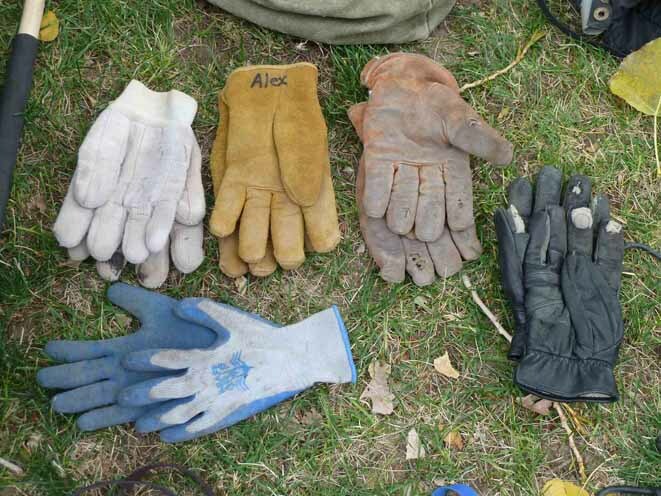 Heavy cloth work gloves seem to hold up fair­ly well and are far supe­ri­or to gloves made of soft leather. Soft leather gloves feel good but are quick­ly ruined when han­dling bark. Stiff leather work gloves hold up for quite a while before holes are worn in the fin­ger tips. One of my favorite type of gloves is a woven mesh glove that has a ribbed rub­ber coat­ing on the palms and fin­gers. These are very com­fort­able, espe­cial­ly in warm weath­er, and wear sur­pris­ing­ly well. Flat pry-bar and medi­um sized crow­bar – My main tool for remov­ing bark from a dead tree is a flat pry-bar. Some­times how­ev­er it will not pry the bark far enough from the tree to free it and then the thick­er crow­bar comes in handy. The crow­bar also can serve as a ham­mer to dri­ve the edge of the pry-bar into a bark crack to get it deep enough under the bark so it can be pried off. Although I do most of the bark clean­ing at home, the flat end of the pry-bar is use­ful for remov­ing a lot crud from the back of the bark in the field. Exten­sion lad­der and/or pole – I have found that these come in very handy when you find that there is good bark that is loose­ly attached to a stand­ing tree and high­er up the tree than you can reach. This can be a haz­ardous oper­a­tion so it is impor­tant to posi­tion your­self and/or the lad­der behind and to the side of the area of bark that you plan to pry or push off the tree. Some­times when you push on a piece of bark you just knock of that piece, but some­times when you push on a piece a huge slab (could be 2′ wide x 10′ tall or more) comes crash­ing down so you have to be care­ful. Wear­ing a hard hat while doing this is also a good idea. 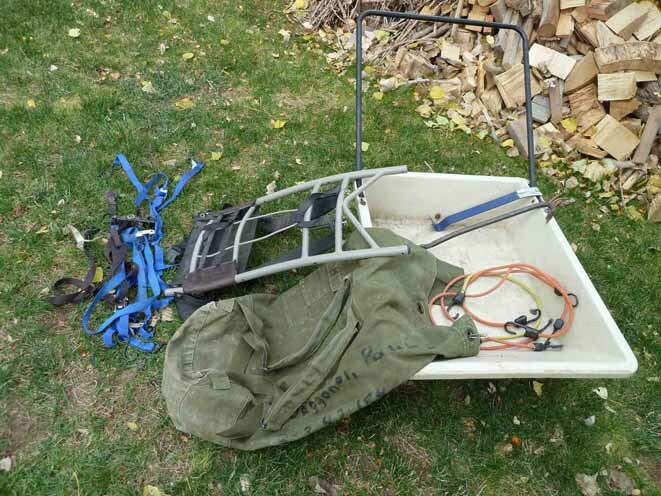 Tools for trans­port­ing bark out of the woods – My favorite tool for this is a light­weight but strong, wide, shal­low gar­den cart as it allows me to haul a very large amount of bark through fair­ly rough ter­rain. I fill the low­er part of the cart with small­er pieces which fit there and then start lay­ing larg­er pieces length­wise over the front and back edges of the cart. I typ­i­cal­ly stack the bark on the cart in this man­ner up to 2.5 feet over the top edge of the cart. 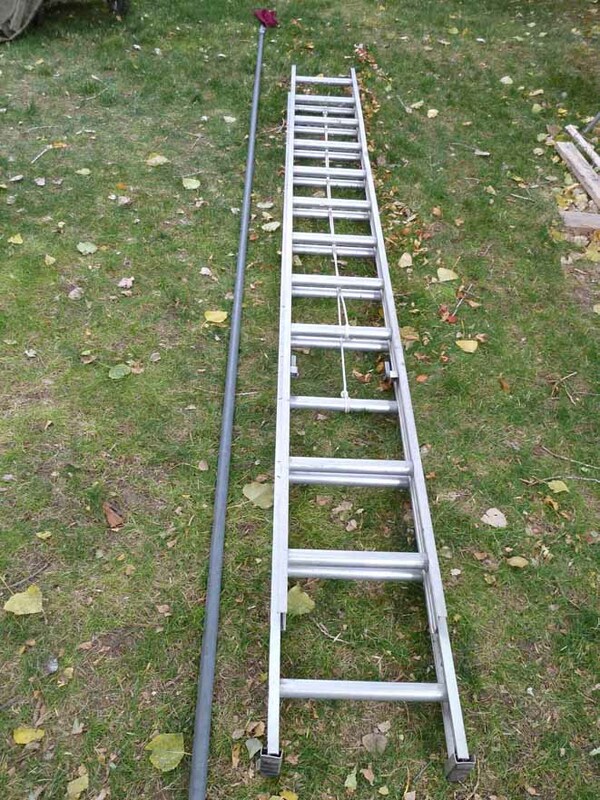 Then I use sev­er­al bungee cords hooked under the edge of the cart and over the bark to the oth­er side to hold the bark in place dur­ing trans­port. I also have a heavy can­vas army duf­fle bag with shoul­der straps that I like to wear when hik­ing through an area look­ing for sources. This allows me to pack some select pieces out if I find any­thing good. I have also used this to pack out bark from loca­tions that were just too hard to get to with a cart. 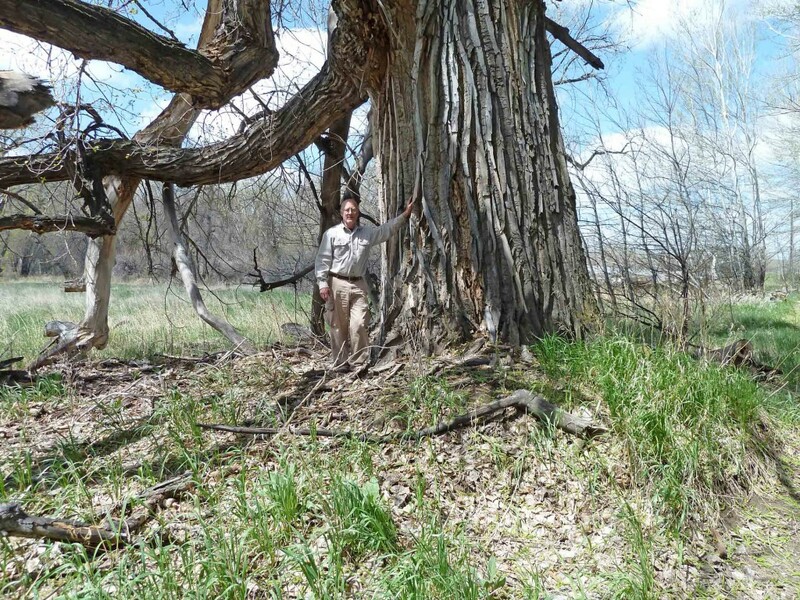 If I find some real­ly good bark a long way from rea­son­able access I some­times bring a rigid back­pack frame to the loca­tion to pack bark. The one I have has a frame at the bot­tom that makes sort of a shelf that sup­ports the bark. To load it, I lay the back­pack frame on the ground, back up, and care­ful­ly lay the best pieces of bark across the pack, stack­ing on it as many as I think I can han­dle. Then I use both bungee cords and nylon straps to secure the bark to the frame. To get it on my back I nor­mal­ly have to hoist the bot­tom of the frame up on a stump or log to hold it up as I get the straps over my shoul­ders. Some years ago I used to do a lot of this but as I have got­ten old­er I find it eas­i­er to accept that some bark is just too hard to get out to be worth col­lect­ing. Get­ting it home – a pick­up truck would be nice but since I do not have one I haul my bark either in the back and on top of my Chevy blaz­er or in a 4′ x 8′ x 2′ sides util­i­ty trail­er. Many times the loca­tions where I find good bark are quite far, up to 150 miles, from where I live. I do not mind going that far if I have locat­ed a real­ly good bark source in an area that far away (usu­al­ly done on a trip for oth­er pur­pos­es) but when I do go to col­lect it I want to get as much as I can at a time so the Blaz­er and util­i­ty trail­er are essen­tial tools for me. Bark Clean­ing Tools – Most bark has lots of shred­ded cam­bi­um lay­er mate­r­i­al and oth­er crude on the back side that needs to be removed and a lot of bark is also dirty on the out­side and should be cleaned before stor­age and use. I do some clean­ing of dirt and waste mate­r­i­al off the back of the bark in the field with the wide, flat edge of the pry-bar but most is done at home. If the weath­er is warm enough, I usu­al­ly lay all of the bark that appears to be real­ly dirty out on the grass in my yard and spray it with a hose and jet noz­zle. Bark pieces knocked from stand­ing trees usu­al­ly does not require this step. After a day or two for dry­ing I move the bark to a loca­tion where I clean any loose mate­r­i­al from the back side. My essen­tial tool for this is a machete or bolo knife (and gloves of course). I have a cou­ple of bolo/machete type knives that I got on e-bay that are ide­al for the job because the cut­ting edge of the blade is curved such that it fits in the inward curve on the back of the bark. While I am doing this I also slice off any bark from the front that is bad­ly delam­i­nat­ing and not sol­id enough for carv­ing. This year there was exten­sive flood­ing along the rivers and lots of bark was coat­ed with a thick lay­er of silt. Although I hosed bark more thor­ough­ly than usu­al, when clean­ing the back of it I noticed that it was still quite dirty and will need fur­ther clean­ing before carving/finishing. This is some­thing I rec­om­mend be done with each piece of bark before it is carved and a good way to do it is in the sink or tub with liq­uid soap and a scrub brush. This will not hurt the bark and will make it eas­i­er to carve and fin­ish. 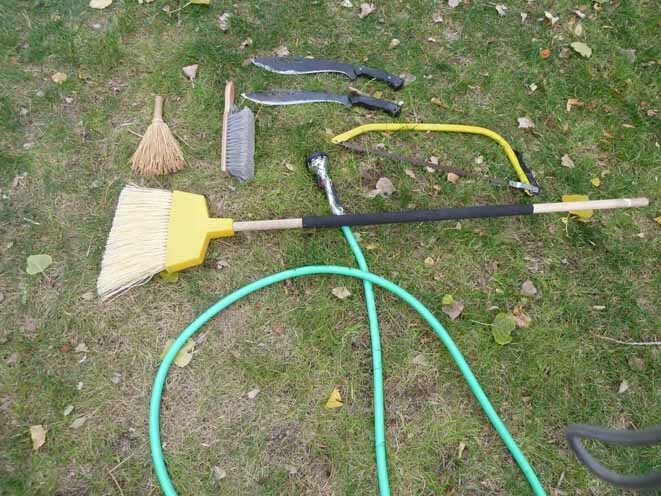 When it is too cold to water blast the bark I some­times lay it out on the lawn and just sweep it with a broom – one pass of sweep­ing from each direc­tion. I have also found a hand brush or whisk broom to be use­ful to clean cob­webs and dust off pieces of bark as I select them for use or sale. Alex Bis­so is a wood­carv­er, and col­lec­tor and sell­er of cot­ton­wood bark and oth­er found wood. To view some of Alex’s carv­ings and cot­ton­wood bark sup­ply at Be So Good Wood, click HERE.